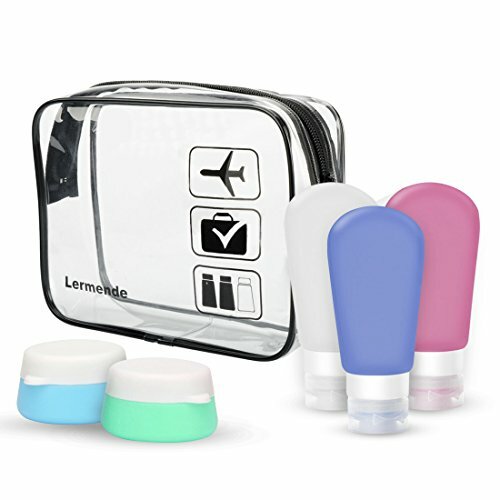 PACKAGE INCLUDE: Our travel size silicon containers contains 3 pieces travel bottles and 2 pieces toothbrush covers. FOOD GRADE SILICONE,BPA FREE: Our silicone travel bottles are made of FDA approved and BPA free food grade silicone, making it safe for other liquids like sauce, salad dressing or even baby food. We fully stand behind our products for their quality and longevity. EASY TO FILL/SQUEEZE: Our travel containers are easy to refill due to the large opening when unscrewing the cap and even easy to squeeze out the last bits of shampoo in order to make sure your shampoo not being wasted. RECOGNIZABLE COLORS: Our leakproof travel silicone bottles sets in same sizes and different colors will help distinguish and sort the contents of each travel bottle and cosmetic containers easily. PORTABLE FOR TRAVEL: The travel size bottles and silicon cream jars for airplane are portable and convenient for dispensing shampoo, conditioner, body wash, lotion and more. Being packed with a refillable shampoo bottles, saving space, easy to carry, TSA airline carry-on approved. 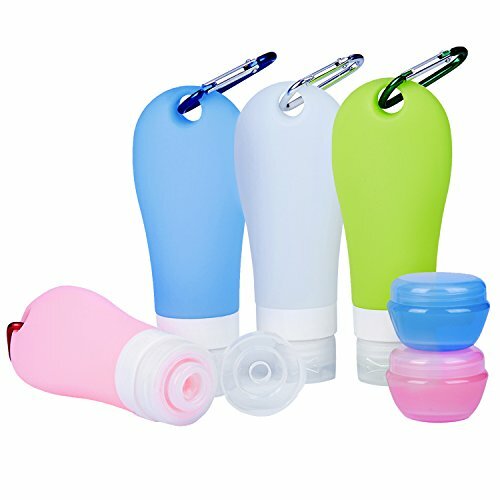 【Colorful Travel Bottle Set】These colorful travel bottle set come with 4pcs 3oz silicone cosmetic container and its own transparent, TSA approved carrying case to boot.It's perfect for shampoo, conditioner, and body wash, but also for lotions, hand sanitizers, and other thicker liquids. 【100% Leak Proof Travel Bottles】Take it with you and go travel! These travel containers are soft and flexible, Each travel bottle comes with 3-layer sealing cap and non-drip valve, offers protection to your luggage and cloths.they're sturdy, reliable, and never leak. 【Safety silicone】Our refillable and reusable travel tubes are designed for safety and convenience. Made from food-safe, pliable but durable silicone,usable for lunchbox for salad dressing, ketchup/mustard etc. 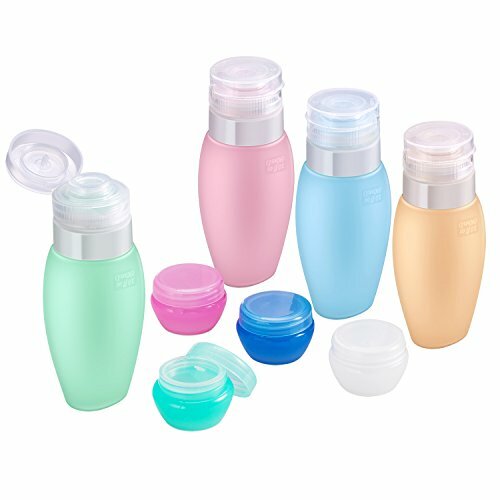 【Easy to fill/squeeze】: Easy to refill due to the large opening when unscrewing the cap and even easy to squeeze out.Refillable. Big suction cup,it can be sucked on smooth wall and mirror whenever you want. 【Used Widely】 Package include: 4pcs 3oz travel bottle and 1pcs clear makeup bag. The travel container set perfect for business or personal travel, activity, outdoors, and more. Also could be a perfect gift for your girlfriend, wife, and family. ★ Say Goodbye to leakage. The travel bottles are soft squeezable, 3-layer leak-proof design prevents liquid leakage or spillage, offers protection to your luggage and cloths. ★ Four Colors, Easy to Distinguish. 4*3 oz & 4*10ml, total 8 pack Color helps sort the contents of the bottle easily. ★ Wide Mouth Bottles. Easy to refill due to the large opening when unscrewing the cap and even easy to squeeze out the last bits of conditioner in order to make sure your conditioner not being wasted. ★ FDA Certificated & TSA carry-on approved! There is no greater frustration than arriving at the airport and having to repack your liquids! 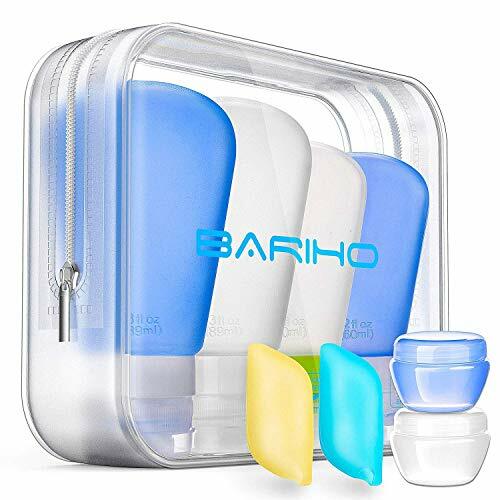 ★ 8 pack Travel Containers/Bottles, neatly packed in a quart-sized, clear, zippered bag, super convenient to keep your shampoos and lotions organized. 8 pack is also ideal for single traveler/ couples and friends. 【Fantastic travel must!】:Don't want to take big toiletry for makeup while traveling?Worried that your shampoo is not allowed to carry into a plane?Wondering how to carry your shampoo to the gmy?All problems solved with these travel bottles. 【Safety silicone】:BPA free and Food safe soft silicone material,usable for lunchbox for salad dressing, ketchup/mustard etc. Convenient to Carry on- The 90ml (3fl/oz) travel bottles sets meet TSA approved standards for liquid, easy to carry it in the airplane. High Quality: Durable silicone materials,our travel bottle sets made of FDA approved and 100% BPA free food grade silicone which making it safe for food and created not to leak. Leak Proof Design: Specially designed to prevent leakage during high pressure changes. A drip release valve only releases the contents of the bottle when a soft, flexible, squeezable silicon flow tube is pressed. Also with three-layer spill-proof cap to prevent your belongings leaks or spills. Easy to Use: Wide mouth for easy refilling with small mouth for user friendly controlled flow! Making sure that these are the easiest and safest bottles a traveler can use! Save Space: Set of 4 travel bottles, perfect for shampoo, conditioner, lotion, body wash, face wash, or sunblock,being packed with a zippered clear toiletry bag, saving space,can take to camping, gym, swimming.Different colors also can help you identify the bottle. 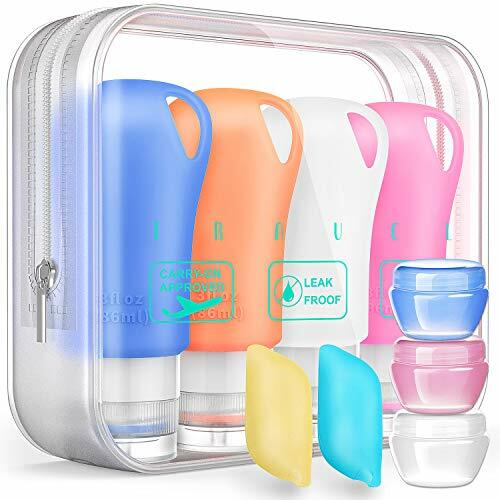 Portable Travel Bottles: Portable Set of Four 3.2 oz Squeezable Leakproof Soft Silicone Containers, 2 cosmetic containers and clear toiletry bag packaging ,Safe and Portable for traveling through airplane. 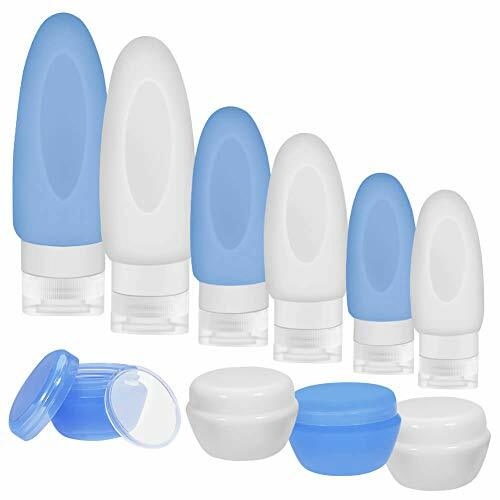 Cross-shaped opening and Anti-leak Design:The Cross-Shaped opening to make appropriate amount of emulsion flows out only when the soft, flexible, squeezable silicon travel tube body is pressed, Each lid has 3 leakproof walls ,Best sealing triple protection anti-leakage + smooth mouth design travel containers. Easy to Refill and Clean: Large opening of our silicone travel bottles makes refills and cleaning easy. Other plastic bottles are hard to fill and leak under changes in pressure. You can easily clean these toiletry containers by soaking in warm soapy water or other way. Food Grade Silicone: Made of premium BPA-free silicone, with FDA safety certification, soft, super-resistant to compression, abrasion-resistant, lightweight and water-resistant，enjoy your trip with various carefully organized toiletries. Recognizable Colors and Best Gifts :They perfect for all kinds of daily liquid necessities, such as conditioner, body wash, lotion and more.Color helps sort the contents of the bottle easily,You also have the option to label it yourself using a marker. 【Fantastic Travel Must!】: Don't want to take big toiletry for makeup while traveling?Worried that your shampoo is not allowed to carry into a plane?Wondering how to carry your shampoo to the GMY?All problems solved with these portable travel bottles. 【No Leakage】: Worried that your costly makeup leak outside of the travel bottles to make your luggage in mess?Worried that your luggage full of smell of your lotion-Best sealing triple protection anti-leakage + smooth mouth design travel containers-Say goodbye to leakage. 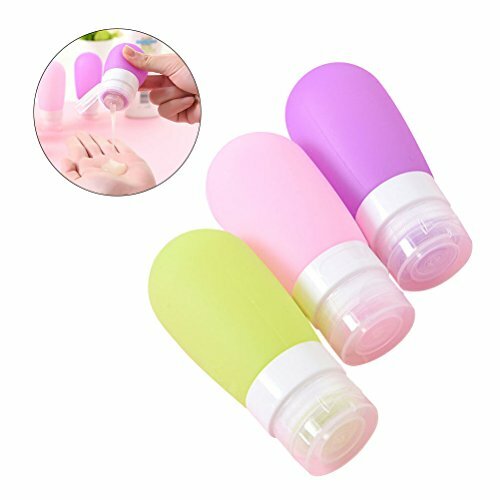 【Easy to Fill/Squeeze】: Refillable cosmetic travel containers, easy to refill due to the large opening when unscrewing the cap and even easy to squeeze out the last bits of conditioner in order to make sure your conditioner not being wasted. 【Safety Silicone】: BPA free and Food safe soft silicone material small bottles containers, usable for lunchbox for salad dressing, ketchup/mustard etc. 【Recognizable Colors】: Muti colors leak proof travel accessories. Color helps sort the contents of the bottle easily. Leakproof and Spill proof. Never worry about breaking your costly makeup glass bottle or have the cosmetic leak to your baggage. These travel bottles comes with its own handy bag so your luggage will not smell like your lotion or toiletry. Easy to fill and Squeeze. With the large opening by simply unscre the cap, you can fill in easily. Unlike plastic bottle, the silicone travel bottle is easy to squeeze out last bit of shampoo or conditioner or empty out. Make sure they are not wasted. Made of High quality Silicone. 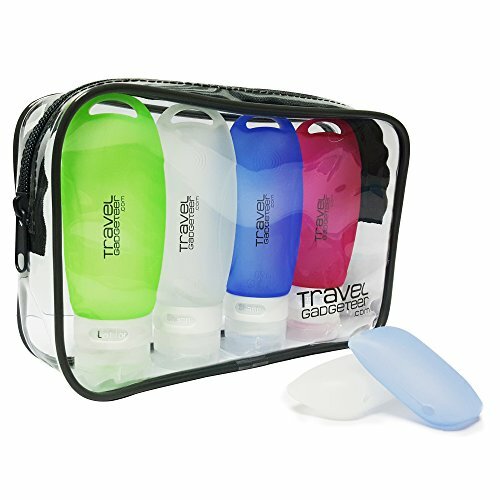 The travel bottle set are made of BPA free and Food Grade Silicone grade. You can even put warmer water and it will not leak. 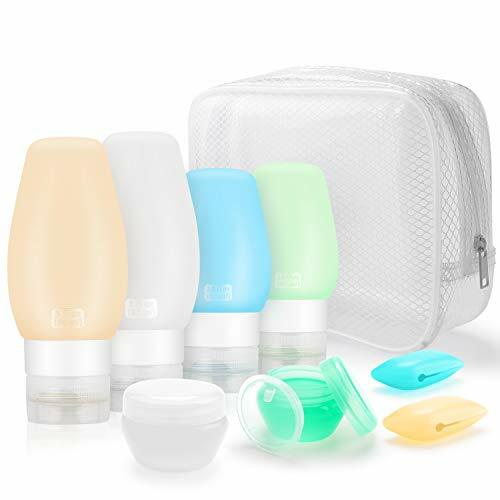 【Multi-function】Perfect for shampoo,lotion, conditioner, face wash, body wash, sunblock, come with a zippered clear toiletry bag, portable, compact, easy solution to security check-ins. 【What You Get】 8pcs travel shampoo bottle and lotion containers and 24hours customer service If you are not satisfied with our products, please contact us freely , we will full refund for you . THREE LAYER LEAK PROOF DESIGN ： The of leak proof air valve adopts food grade silica gel elastic film,can helps control how much liquid is squeezed out. plus the travel bottle cap is fitted with 3 leak-proof layers that will prevent liquid leakage or spillage in the bottle, so as not to befoul your luggage or clothing,Never worry about any liquid leakage. SECURITY GUARANTEE & EASY TO CARRY ： The silicone travel bottle in line with TSA can carry the liquid range,so you can carry it in the airplane,before travel can be dispense large bottles of shampoo, shower gel and other emulsion, to travel enthusiasts to bring convenience,but also for people who often business,to make your travel lighter. HIGH QUALITY AND DURABLE ：The food grade silicone are soft squeezable that's Flat, placed side, and placed freely,while it has waterproof function,the bottle cap is made of high quality material, more wear-resistant, to prevent the junction of broken,so they won't crack or break while you're travelling.They can even withstand drops, meaning that you won't have to replace them very often! 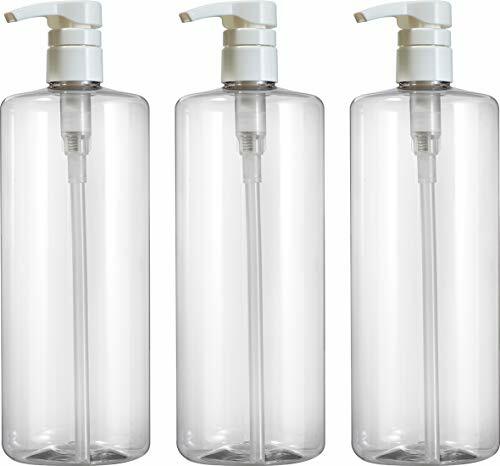 SIMPLE FASHION AND EASY CLEANING ： The travel bottle bottle mouth isWide mouth design making it easy to fill the bottle and cleaning easily,you can easily clean these toiletry containers. 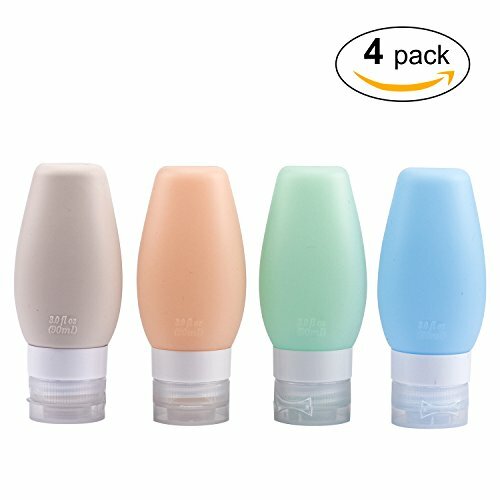 MULTIPURPOSE & SAVE SPACE ： Set of 4 travel bottles, perfect for shampoo, conditioner, lotion, body wash, face wash, or sunblock,being packed with a zippered clear toiletry bag, saving space,no more hold ups or hassles at the airport and enjoy the journey,can also take camping, gym, swimmingyou must need such a sub-bottling travel bottles,Click 'Add to Cart' now & enjoy great value for money! Durable & Leakproof: Toiletry travel bottles set are made of ECO friendly PET-1 plastic, they are reusable and leak-free. Toiletry bag is made from clear TPU material and reinforced with stitches, can be used for long time. 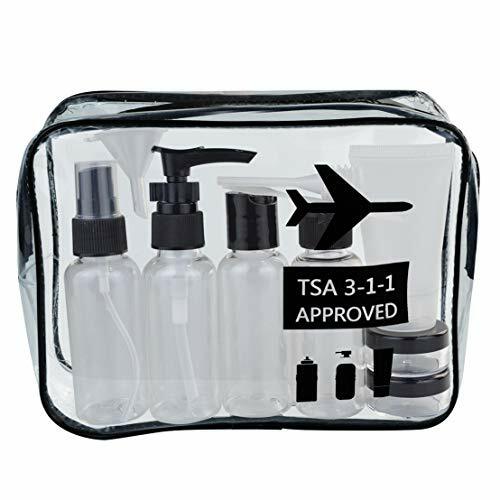 Designed for Travel / Outdoors: TSA Approved travel toiletry bag and bottles are fully compliant with 3-1-1 rule, Help you easy and quick to pass through airport security, for carry-on at the airports worldwide for domestic and international travel. Multi-function Travel Accessories: Super convenient to pack and organize your shampoo, lotion, cream, conditioner organized and so on neatly. Travel set comes with convenient mini spatula, pipette and funnel to easily transfer liquids and creams. Perfect Bottle Set: 1 Pump bottle, 1 Spray bottle, 1 Soft tube, 2 Squeeze bottles and 2 Jars, enough to meet your deferent needs. A perfect gift for any occasion. Wide Usage & Stylish - travel kit is ideal for carry-on luggage, travel, cruise, business trips, gym, camping, picnic, beach, cosmetics. Stylish and compact design suits well women and men of all ages. 【Goodbye leakage】:Triple protection anti-leakage cap with smooth mouth design prevents your expensive toiletries leaking all over your luggage bag.With these travel bottles,no risk a single drop leaking out.Start seeing the world without any frustration. 【Easy to use】:The silicone containers are wide enough opening for easy refilling and cleaning.Squeezable body to make sure you get every drop out. 【Quality package bag】：No longer needs to buy a new bag with our upgrade version waterproof travel toiletry bag.Exquisite sewing workmanship for zipper and plastic piping around make the toiletry bag hard to broke. LEAVE LEAKS BEHIND: These leakproof silicone squeeze bottles make leakage a thing of the past. Our 3 ounce silicone travel containers have unique design and features several layers of protection to keep your liquid travel bottles full and the inside of your bag, dry. EASY TO SQUEEZE AND FILL / REFILL: Filling up your new travel bottles is a breeze and they are just as easy to squeeze. No need to bother with those travel sized shampoo and conditioner containers. Everything from travel shampoo and conditioner to liquid soap, body wash and lotion are perfect for this reusable travel bottle set. LVLY GUARANTEE, BUY WITH CONFIDENCE: Your TSA bottles, bag, and toothbrush cover is covered by a 18 month warranty. Should anything happen to your set, or you are unhappy for any reason, reach out to us directly through Amazon's message platform, and we will replace your bottles, bag, and toothbrush covers at no cost. MOST BANG FOR YOUR BUCK: This travel accessories sets comes with 4X 3 ounce travel containers it also includes 2 toothbrush holders and 1 clear tsa approved travel toiletry bag. FOOD GRADE BPA FREE SILICONE: Each silicone tube is FDA APPROVED, BPA FREE, and FOOD SAFE. 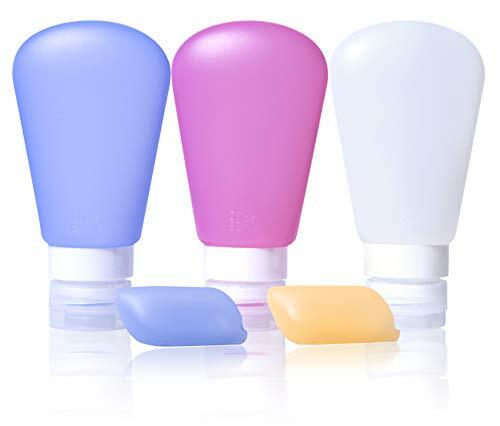 The LVLY silicone travel bottles feature a food safe soft material, making it safe for sensitive skincare products along with other liquids and even foods. 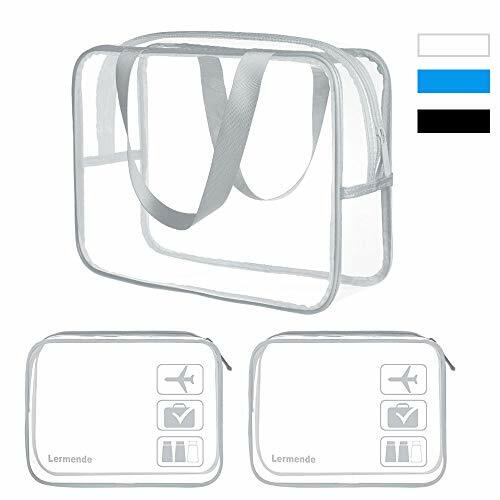 【Airline Travel Pal, Great Outdoor Solution】：Soft travel containers/bottles, neatly packed in a quart-sized, clear, zippered and check-out friendly bag, super convenient to dispense your shampoos, lotions and etc. Perfect for business or personal travel, camping, hiking, picnic, fun outdoors and gym. 【No Leak or Spillage】：Drip free dispenser valve releases bottle contents only when the soft, flexible, squeezable silicon travel tube body is pressed. Each lid has 3 leakproof walls to protect your personal items in your luggage from leaks or spills. The silicone gasket placed around the collar rim stops side leakage. Won't leak even under the changes of pressure. 【Easy to Refill, Clean and Store】：With wide mouth opening, refilling and cleaning become sweat-free experiences. Easy to squeeze out the last bits of squeezable water bottle in order to not being wasted. 【Easy Content Identification】：Twist the movable labels in the neck of the cap to show the contents inside. it is easy to distinguish or sort the substance in each travel bottle by different color or lable. 【Food Grade Silicone, 100%BPA Free】： Made of superior quality that will last a long time, these silicone travel bottles are FDA approved and BPA free, making it safe for other liquids like sauce, salad dressing, ketchup, mustard or even baby food. PERFECT SIZE FOR ANY KIND OF TRAVEL: TSA carry-on approved assortment size make the travel bottle convenient for you to carry on airline. Small handy size of 3oz bottle is 5 5/16", 2oz bottle with height of 4 9/16", 1.25oz bottle is 3 5/8", 20ml cream jar is 1 3/16" takes little place in your luggage while the capacity is very enough for the short time business trip, vacation trip, travel, gym, school or outdoor activities etc. 【Portable】The travel containers can solve your trouble how to take toiletry when you go out, there is no doubt carry on airplane for it's suitable size, Dispel the troubles of large bottle. 【Safety】Safety material, 100% FDA approved, bpa free food grade silicone travel bottles set. 【Easy】Wide mouth can fill in easily, You can choose which you want with rotating label and a20ml jar can be used to fill cream. With a spray bottle and a 20ml jar can enrich your journey. 【Leak Proof】 Three-layer leakproof design can 100% make travel bottles leak proof (Please read the leakproof instructions). 【After Sale】We promise the travel toiletry bottles quality . Any problem, feel free to contact us to have another one or have refund. GUARANTEED: GUARANTEED: We are so confident in our leak proof silicone travel bottles that we will 30 days money back guarantee with two year warranty! 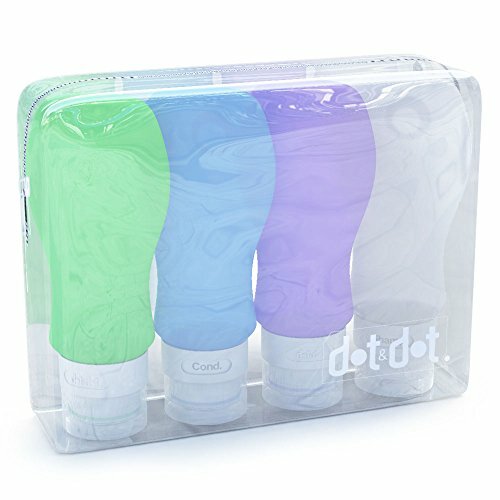 Portable Travel Bottles：Portable Set of Four 3.2 oz Squeezable Leakproof Soft Silicone Containers and clear toiletry bag packaging ,Safe and Portable for traveling through airplane. Anti-leak Design: Drip free dispenser valve releases bottle contents only when the soft, flexible, squeezable silicon travel tube body is pressed, Each lid has 3 leakproof walls ,Best sealing triple protection anti-leakage + smooth mouth design travel containers,Say goodbye to leakage. Easy to Refill and Clean ：Large opening of our silicone travel bottles makes refills and cleaning easy. Other plastic bottles are hard to fill and leak under changes in pressure. You can easily clean these toiletry containers by soaking in warm soapy water or other way. VASLON Leakproof Travel Bottles 3.3 oz 4 Pack per Set,TSA Refillable Squeezable Silicone Travel Containers and Protable Clear Travel Bag. Easy to Refill and Clean：Large opening of our silicone travel bottles makes refills and cleaning easy. Other plastic bottles are hard to fill and leak under changes in pressure. Easily identify contents of your bottle ：Color helps sort the contents of the bottle easily. High quality ：Our travel bottle set is made of FDA approved and 100% BPA free food grade silicone, making it food safe. Leak proof silicone: Each 100% BPA Free silicone bottle has been created not to leak when travelling. The food grade silicone are soft squeezable that's Flat, placed side, and placed freely, while it has waterproof function, the bottle cap is made of high quality material, more wear-resistant, to prevent the junction of broken, so they won't crack or break while you're travelling. They can even withstand drops. Set of 5, 3 oz 89ml travel bottles, perfect for shampoo, conditioner, lotion, body wash, face wash, or sunblock. BPA free and Food safe soft silicone material, usable for lunchbox for salad dressing, ketchup/mustard etc. The of leak proof air valve adopts food grade silica gel elastic film, can helps control how much liquid is squeezed out. plus the travel bottle cap is fitted with 3 leak-proof layers that will prevent liquid leakage or spillage in the bottle, so as not to befoul your luggage or clothing, Never worry about any liquid leakage. The large opening mouth makes the mini travel bottles set air travel easy to fill and clean. Twist the movable labels in the neck of the cap to show the contents filled in the travel bottles. Different colors also make it easy to distinguish or sort the substance in each travel bottle. ♥ LEAK-PROOF DESIGN - Each lid contains 3-layers, which implies that no liquid will leak out even the product is placed upside down. You do not need to worry that they will spill in your luggage. 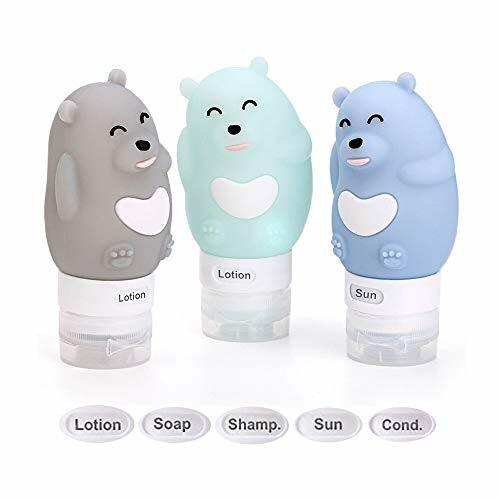 ♥ WITH LOOP AND SUCTION CUP - The travel bottles contain a loop and a suction cup on the them, which makes them easy to hang, or attach them on the shower wall. 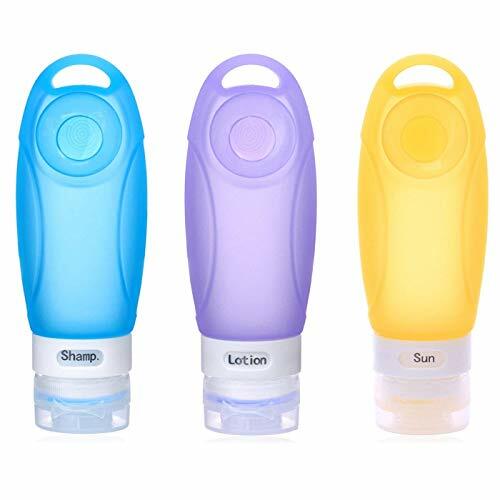 ♥ ADJUSTABLE LABELS - Silicone travel bottles have labels (Sun, Cond, Shamp, Lotion, Soap, and a blank one) on the cap which you can rotate to adjust the label to your preference, or write your own labels according to your requirements. ♥ SUPERIOR QUALITY - Our travel toiletry bottle set is made of FDA approved and 100% BPA free food grade silicone which makes it safe for food. Durable, unbreakable and approved to carry in the airplane. 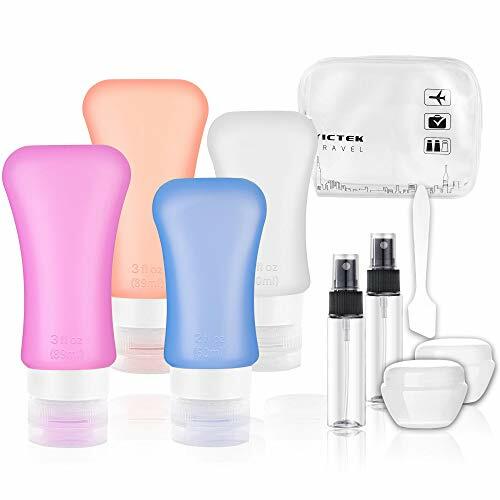 ♥ CONVENIENT TRAVEL ACCESSORIES - Silicone travel bottle set allows you to lighten your load while still being able to bring your necessities such as shampoo, conditioner, and lotion. The bottle size is 3 OZ, which is large enough for a 7-day trip. Very handy for travelling. A great mother's day gift. 【PACK PORTABLE & NEAT!】 Stop frustrations of carrying messy bottles, get away with visual noise of commercial packaging by simply grabbing this nice and clean bottle-set for packing liquids! 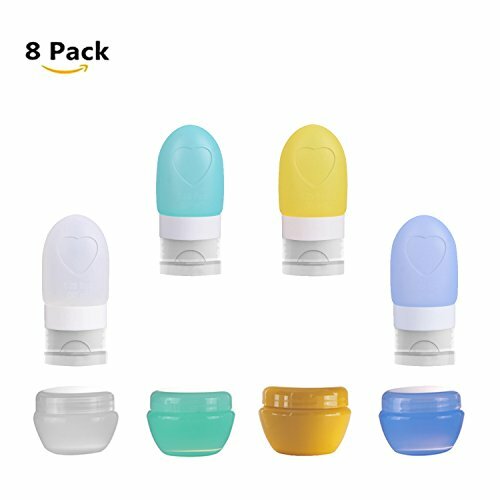 These travel accessories are made of soft and squeezable silicone with wide mouth for easy refill and cleaning,super compression resistance, lightness, durable and waterproof. 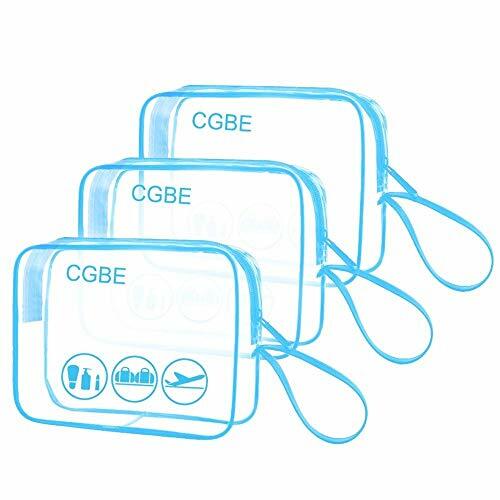 【AIRLINE TSA APPROVED, GREAT OUTDOOR SOLUTION】10 Pcs pack travel accessories, neatly packed in a clear, zippered bag, super convenient to keep your shampoos and lotions organized. AND is also ideal for single traveler/ couples and friends. 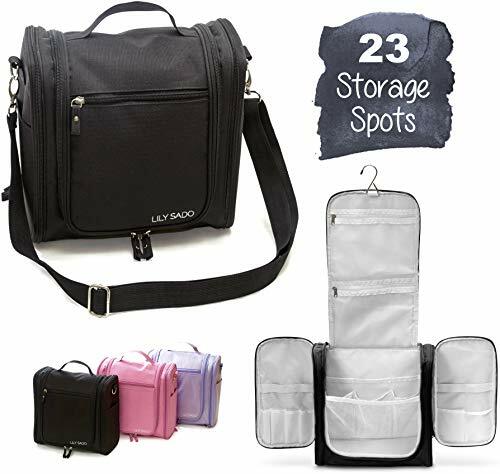 Perfect for business or personal travel, camping, hiking, picnic, fun outdoors, gym etc., act and enjoy this amazing value of money!There is no greater frustration than arriving at the airport and having to repack your liquids. 【UNIQUE LEAKPROOF DESIGN!】 3-layer leak-proof design prevents liquid leakage or spillage, offers protection to your luggage and cloths. Opal shape allows no liquids stuck in the bottle corner and helps you to get the last drop out without wasting any privacy products.Leak proof travel bottles for you. ❣️Meets Carry On Standards - Refillable, reusable travel size bottles and EVA clear toiletry bag packaging are TSA approved and safe for carry-on/traveling through airplane. Our travel bottles set included(4 pieces 3 Fl.oz travel bottles , 2 pieces 10ml Plastic Cream containers). ❣️Three Layer Leak Proof Design: Our silicone travel bottles are designed with a silicone stretchy film in the small mouth and 3-layer anti-leakage cap design, can helps control how much liquid is squeezed out. To protect your personal items in your bag from leaks or spills.The large travel bottle can Stand up by both sides.So as not to befoul your luggage or clothing, never worry about any liquid leakage. 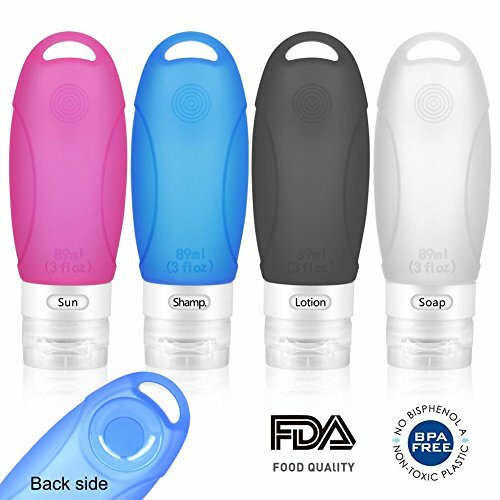 ❣️Safe and practical silicone no leak travel bottles: made of FDA approved and 100% BPA free food grade silicone, making it food safe. Suitable for dispensing shampoo, shower gel, lotion,face cream,sunscreen and other creamy objects, also be used for kitchen packing honey, tomato sauce, salad dressing, etc. Outdoor travel, home use to bring convenience; no more hold ups or hassles at the airport and enjoy the journey, can also take camping, gym or swimming. ❣️Easy to Refill and Clean - our silicone travel containers with wide mouth designmakes ,makes refills and cleaning easy. Other plastic bottles are hard to fill and leak under changes in pressure. You can easily clean these toiletry containers by soaking in warm soapy water or by using the dishwasher (top rack only). ❣️Easily identify contents of your bottles - CHFUN leakproof travel bottles 3 oz contains ID labels Paper (shampoo, conditioner, sunscreen, body lotion,cream...), you can stick the labels to identify contents of the bottle. &#x1F381;WHAT ESSENTIALS DO YOU USUALLY KEEP in your carry-on when you are traveling?This travel toiletries containers may help you a lot,there are 4 refillable silicone squeeze bottles,2 sprayer bottles,one spoon and 2 cream jars,perfect for your business trip or a short traveling. 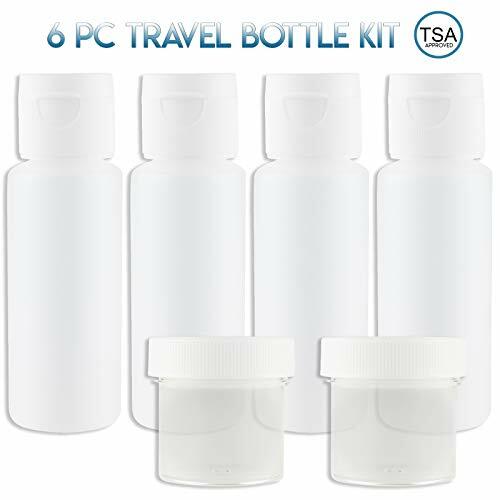 ✈TSA APPROVED TRAVEL ACCESSORIES:All of these refillable travel containers meet the requirements for TSA approval of airline requirement,so you can top them up with your favorite personal hygiene products and prepare for boarding as you want. &#x1F333;FLEXIBLE ABD EASY TO USE:These travel bottles are made of flexible,food grade silicone,so not only are they perfect for keeping your preferred brand of shampoo,sunscreen,lotion conditioner,or body wash handy,you can also use them to store honey,syrup,liquid medicines and other ingestibles for the journey.Soft and squeezable body with wide mouth so they are easy to use and be cleaned up. &#x1F4A7;LEAKPROOF DESGIN AND:These travel toiletries bottles come with triple-rim sealed caps that could help you snap securely shut to minimize the possibility of leakages so there is no need to worry about the leakages or wasting when you are on a trip outside.These 2*3 oz and 2*2 oz soft silicone travel containers come in different color and cosmetics LABELS, which could be easily identified and convenient to use. 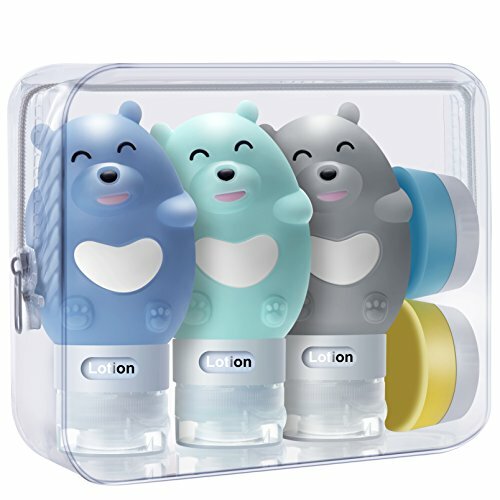 ✔SAFE TRAVEL ACCESSORIES: The travel bottles are a pack of 5pcs cosmetic container made of BPA-free silicone and plastic, which approved by FDA (USA) and LFGB (Germany). 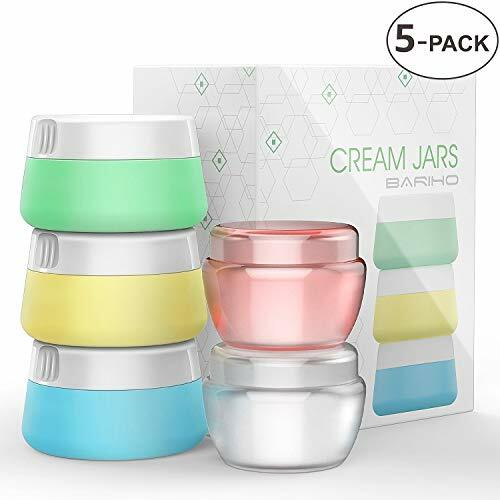 ✔HELPFUL CREAM JARS: These travel containers are convenient to store lotions, cream, shampoo, powder, condiments, etc. Mutiple uses for these silicone cosmetic containers. ✔NO LEAKY DESIGN: These cream jars are designed with anti-drip flip cap to prevent leak and spill. The appropriate mini size and light weight is great for travel, good seal character without worrying of staining your baggage,leakproof travel jars.Makes a great gift or stocking-stuffer. ✔EASY TO CLEAN: You can easily clean these silicone makeup containers by warm soapy water. 5 pieces come with different color, you can easily identify what each one contains by read the color. ✔QUALITY WARRANTY: Each of our travel bottles sets are guaranteed to provide you with long-lasting enjoyment, with a modern style that's made from the highest-quality sourced materials.Take your favorite beauty creams, cleansers, and moisturizers with this set of five jars in an FDA-approved size on the traveling when you go out for a business trip. WELL DESIGNED TRAVEL BOTTLE - White and purple elegant color designed suction cup, suitable for shampoo, lotion, conditioner, sunscreen, body wash, or other toiletries, even milk. They are soft squeezable, rugged silicone liquid transport travel shampoo bottles/containers perfect for business or personal travel, fun outdoors, and much more. SAFE AND SOFT MATERIAL - 100% BPA free food grade silicone, FDA-approved. They are food grade they can also be used for your lunchbox for salad dressing, ketchup/mustard etc. GOOD QUALITY -Made From silicone which is More resistant to heat and cold that plastic and less susceptible to breakage.They are tsa approved refillable shampoo bottles. LEEK PROOF DESIGN - The travel bottles/containers are designed by a three-layer leak-proof structure which are soft squeezable and have high leak-proof level , don't worry about the embarrassment of the liquid leak in your bag. TSA CARRY-ON APPROVED- Take it with you and go to travel!There is no greater frustration than arriving at the airport and having to repack your liquids! All the travel size bottles/containers meet TSA standards for liquid, Suitable for every situation, swimming pool, trip, hotel and so on. 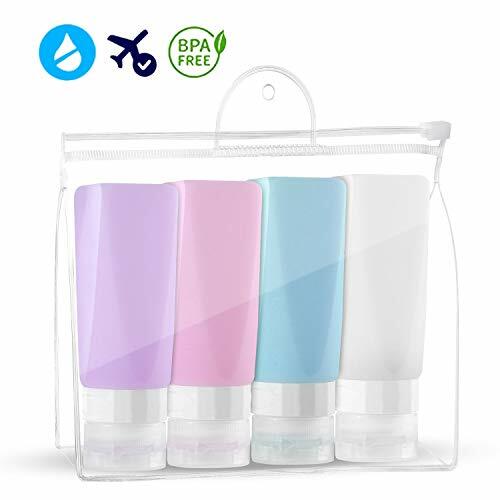 1.LEAK PROOF REFILLABLE AIRLINE TRAVEL BOTTLES: Each Travel Lotion Bottle 100% BPA Free Food Grade silicone bottle set has been created not to leak. 2.EVA CLEAR TRAVEL CASE: The high quality Toiletry Bag will allow you to pack all of your toiletries safely. 3.ID WINDOW EASILY IDENTIFY CONTENTS: Each travel size toiletries bottle is a different color and has a rotatable cosmetics collar so you can change the text that shows. 4.PORTABLE SHOWER LANYARD: It dries quickly,Hanging shower caddy, hangs from showerhead or control.Great for Gym Shower, travel, camping, cruises, the fitness center, or the dorm. 5.LARGE SIZE TRAVEL LIQUIDl CONTAINERS: The travel kit bottles set are 3.3 oz making them the largest carry on bottles allowed.Soft silicone body allows you to easily squeeze out that last drop of shampoo.AusKit travel bottle is Great Mother's Day Gift. ✔️LEAK PROOF GUARANTEE - While other bottles leak and create unwanted disasters for many travelers. This revolutionary design could just be the answer to all your travel problems! Never will you have to worry about cheap containers busting open and ruining your entire wardrobe or luggage again. ✔️TSA APPROVED - Save the hassle of ever having to deal with TSA rummaging through your luggage to find the one oversized bottle ever again! All bottles and bags have been pre-TSA approved for travel to fit your carry-on as well as your main luggage. ✔️WIDOW CONTENT DISPLAY - Stop the guessing! With easy to read adjustable windows to make certain you know exactly what you are using, these bottles will forever ease you're your traveling experience. ✔️DOUBLE THE SUCTION & EAILY REFILLABLE - With twice as much suction power as others these bottles will have NO TROUBLE sticking to mirrors, showers, or whatever you please. The soft body design allows for easy cleaning of whatever substance you previously used, allowing you to refill effortlessly. ✔️100% 30 DAY REFUND - You love it or we'll buy it back, no questions asked. 1.DESIGN UPGRADE: It features a handle so you can hang it on a towel rack, shower rod or anywhere you need. Easy to carry travel. Strong black bone to support frame. Well-construced zipper with lightweight alloy zipper head make it more smooth. Metal buckle to avoid zipper opened&defective. 2.TSA APPROVED: The TSA approved toiletry bags fully meet 3-1-1 rules and requirement of all airlines.Pass through airport security easy and quick. No waste your time and no more holds up or hassles at the airport. 3.ECO-FRIENDLY PVC MATERRIAL: The TSA Approved Toiletry Travel Bag is made with environmentally friendly, waterproof, dust-proof, clear PVC material, so you can find and get the items quickly. It's Durable and Reusable that you can built to last with you for the Long-term. 4.STAY ORGANIZED: Clear toiletry bag for Air travel keeps your bottles, Containers, Cosmetics,Small Toiletries, and Liquids in One Place. It is clear so we can easily find our bath and beauty products. Bag is Easy to Clean After Use and Wash.
5.SIZE:The Quart Bag Measure is 7.9 x 5.9 x 2.4 inches, fitting all the shampoo, lotion, makeup things in a quart ziploc bag. It is convenient to carry on when you are travelling or go out. High quality for safe cosmetic containing to meet your multiple cosmetic holding requirements during travel. Bottles' sizes are within the acceptable limits of airlines. Also perfect for your shampoo, conditioner, lotion, cream, etc. Portable sizes for travel, trip, camping, etc. Designed with safety first and convenience a close second. 【PACK LIGHT & NEAT!】 Stop frustrations of carrying messy bottles, get away with visual noise of commercial packaging by simply grabbing this nice and clean bottle-set for packing liquids! Made from premium-quality silicone + PP material, super compression resistance, lightness, durable and waterproof.These travel accessories are made of soft and squeezable body with wide mouth for easy refill and cleaning. 【AIRLINE TRAVEL PAL, GREAT OUTDOOR SOLUTION 】2*3oz & 2*2oz soft travel containers/bottles, neatly packed in a quart-sized, clear, zippered bag, super convenient to keep your shampoos and lotions organized.4 Pcs pack is also ideal for single traveler/ couples and friends. Perfect for business or personal travel, camping, hiking, picnic, fun outdoors, gym etc. Spend the least money and buy the best, most comfortable products. 【SAY GOODBYE TO LEAKAGE AND LAST-DROP WASTE!】3-layer leak-proof design prevents liquid leakage or spillage, offers protection to your luggage and cloths. Let you no longer worry about leakage, easy travel. ✅ TRAVEL ESSENTIALS: Have good hygiene everywhere you go, with your portable toiletry set have the freedom to take your shampoo, conditioner & lotion products with you on the go! We know how important cleanliness is, so we've designed a set that can be easily packed and used at your disposal. ✅ 100% GUARANTEED LEAK PROOF: Our premium build quality prevents having to deal with leaky bottles or containers, made with triple anti-leakage protection you can take this set with you on any trip without the added trouble! ✅ EASILY REFILLABLE: Screw-off caps with large openings make it easy to empty any remaining product or to refill your bottles & containers. ✅ BPA-FREE SILICONE: Made from food-grade, BPA-free silicone - With safety in mind, you can now fill your bottles with condiments, sauces & any liquids. ✅ 30-DAY LINGITO WARRANTY: If you are not absolutely 100% satisfied with your purchase, let us know right away! Lingito prides itself on its quality and customer service. &#x1F534; SUPERIOR QUALITY & DESIGN - The LILY SADO Travel Toiletry Bag provides the best value for your money. Say no to toiletry organizers that don't have a shoulder strap; smell like chemicals; or are made of cheap fabric that isn't double stitched or water-resistant. Our premium Travel Bag has stylish, water-resistant fabric with double stitching; 23 STORAGE AREAS WITH 150% MORE SPACE than standard bags; 6 sturdy stainless steel double zippers; and an antibacterial, waterproof inner lining. &#x1F534; MAKES THE PERFECT GIFT - Compare the LARGE SIZE (10.5"H x 11"W x 5.5"D) and modern, sleek design to other Hanging Travel Organizers. You'll be AMAZED at how many items are easily organized: hair dryer, large shampoo bottles, long brushes, curling irons, shaving kit, electronics, baby supplies, vitamins & prescriptions, and any items up to 9.5" tall. Many couples find room for two! Perfect for vacation, camping, gym, yoga, business trips, school, picnics, and saving bathroom space. &#x1F534; QUALITY IS IN THE DETAILS - 6 stainless steel double zippers feature stylish fabric pulls. Adjustable, removable 36" shoulder strap has a stainless steel interlocking clasp. Durable fabric has classic square stitching. Inner lining is waterproof, leakproof & anti-bacterial to protect against moisture & bacteria. Double stitching at trim reinforces support for MAXIMUM WEAR RESISTANCE so your bag will hold up to heavy-duty use-come rain or shine. WE GUARANTEE IT, OR YOUR MONEY BACK. TSA APPROVED: Don't like the toiletry provided by hotel? Don't want to carry many big bottles when traveling? Worried that your shampoo is not allowed to carry onto a plane?Qihui travel accessories for liquids will fix all these problems. Set of 4 travel bottles, perfect for shampoo, conditioner, lotion, body wash, face wash, or sunblock. Being packed with a TSA approved travel toiletry bag, easy to carry without checking, no more hold ups or hassles at the airport. TRIPLE LEAK PROOF: 3 anti-leak walls fitted on the cap of the travel bottles protect your luggage from dripping and spilling; the self-sealing valve in the lid keeps fluid from leaking out; The silicone gasket placed around the collar rim stops side leakage; The lid holds tight, no worry about leaking from accidently open. 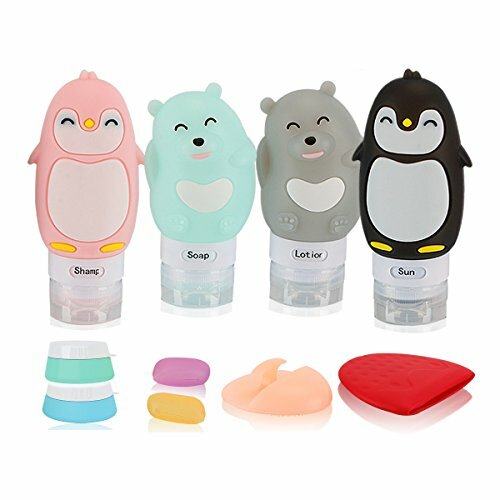 EASY TO USE: Qihui squeezable travel bottles features soft silicone body and wide mouth design, easy to fill, easy to squeeze and then to clean and refill. CONTENT IDENTIFICATION: Twist the movable labels in the neck of the cap to show the contents filled in the travel bottles. Different colors also make it easy to distinguish or sort the substance in each travel bottle. FOOD GRADE SILICONE, BPA FREE: Qihui silicone travel Containers are made of FDA approved and BPA free food grade silicone, making it safe for other liquids like sauce, salad dressing or even baby food. We fully stand behind our products for their quality and longevity. Any problem, feel free to contact us for a prompt refund or replacement as necessary. 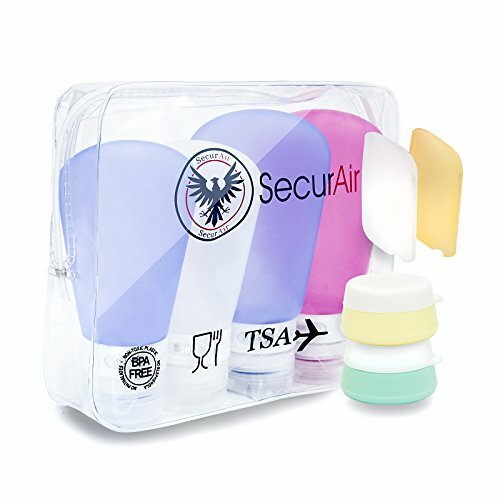 ♛《TSA AIRLINE APPROVED》 : 89ml (3fl.oz) travel bottle is approved TSA standard, so you can carry it in the airplane. ♛《NO MORE LEAKS》 : There's nothing worse than opening your suitcase and finding your shampoo has leaked all over your wardrobe. We've taken care of this issue with a lid that only releases contents when you firmly squeeze the bottle. Each cap is fitted with 3 leak-proof walls that will protect your luggage from drips and spills. ♛《BPA FREE, FOOD GRADE SILICONE》 : Don't compromise your safety or quality. Constructed of the best materials, you're guaranteed a strong, sturdy design that will last you a lifetime of travel & adventure. These are the last set of squeeze bottles you will ever need! ♛《HOOK DESIGN WITH STRONG SUCTION CUP》 : Whether hang or adsorb on the wall, it is very convenience for using, and easer for you to catch shampoo and conditioner in the shower. ♛《CONTENT IDENTIFICATION》 : Switchable label, each travel bottle has pre-printed labels (Shamp./ Soap/ Lotion/ Cond./ Sun/ Empty) to identify liquid in the bottle. Different colors also can help you identify the bottle. 100% LEAK-PROOF GUARANTEED: We have altered these travel containers and tested it persistently to ensure they DO NOT leak! DIFFERENT SIZES: We think a set of two 3-oz bottles, two 2-oz bottles, two cream jars, and two toothbrush / razor covers gives you the perfect combination to maximize use of your limited packing space. But if you disagree, let us know and if there are enough of you, we'll adjust our next batch and let you know as soon as they are ready. ADJUSTABLE LABELS: Our adjustable labels will stop any confusion. And we know that a life on the move means showers aren't always spacious and convenient. BPA-FREE TRAVEL BOTTLE KIT: Made from BPA-free silicone, food grade, you can fill these with condiments, sauces, or any liquid you would like. TRANSPORTATION SECURITY ADMINISTRATION (TSA) - APPROVED: Taking these in your carry-on baggage? Not a problem - all of our SecurAir silicone travel bottles are see-thru, and well under the 3.5 oz restriction for taking onto planes.